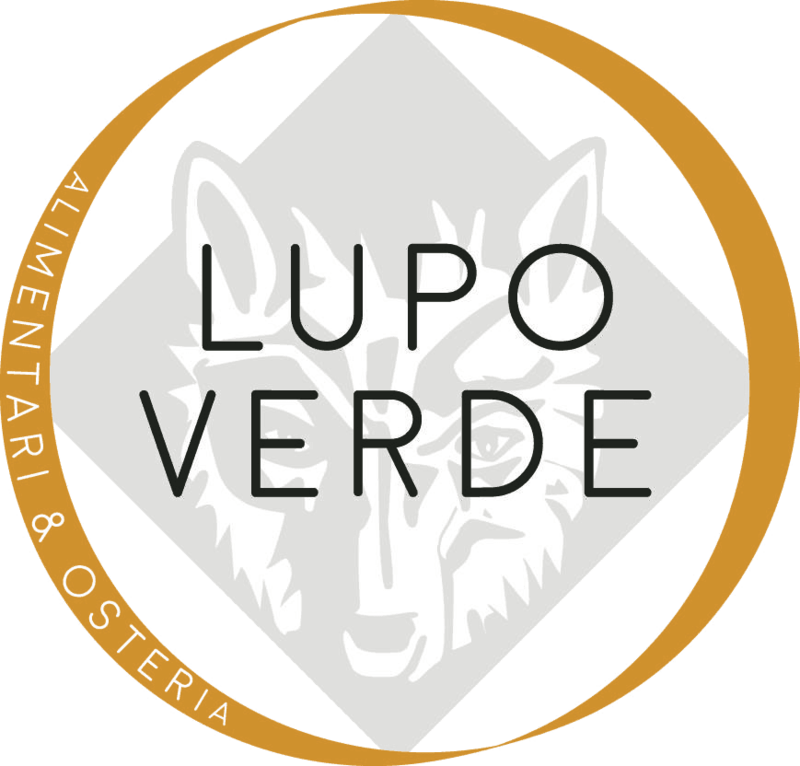 Lupo Verde Osteria is an intimate 95-seat restaurant located in the Palisades area west of Georgetown. 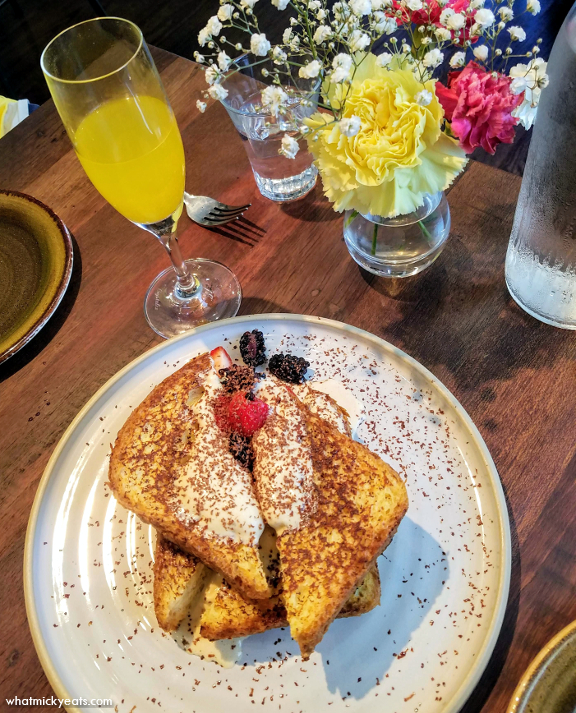 We trekked out of our way to try the new Social Brunch that debuted in July and is now available Saturday and Sunday, from 11 a.m. to 3 p.m. Priced at $35 per person (excluding tax and gratuity), guests can enjoy authentic, rustic, Italian fare in a family-style format. 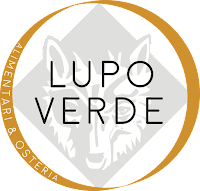 Diners will be able to select one antipasti, one side dish, two pastas or egg dishes and one bottle of prosecco off the featured menu prepared by Executive Chef Todd Sprik. I couldn't decide between traditional brunch fare like eggs and pancakes or the more Italian options like the house-made pastas, but finally decided on the latter. 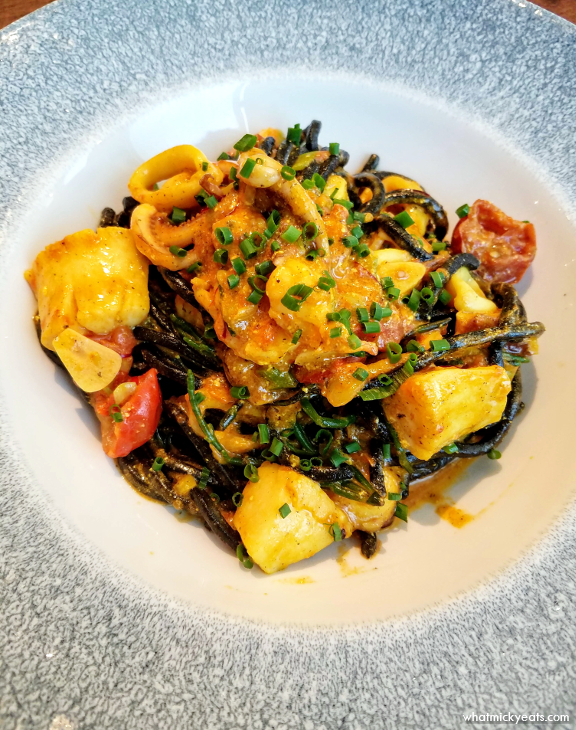 I chose the Black Ink Pasta with Seafood that had a creamy tomato sauce and was studded with tender calamari, scallops, and shrimp. Keith enjoyed the Carbonara made with thick al dente pasta and creamy egg sauce with Italian bacon. He found his pasta dish to be a compromise with breakfasty ingredients. With our pasta we shared a side of Asparagi with both white and green asparagus and potatoes that were lightly pan fried. Lastly, as a 'dessert' we shared the Toast al Tiramisu with coffee-soaked brioche bread, tiramisu cream, and shaved chocolate. 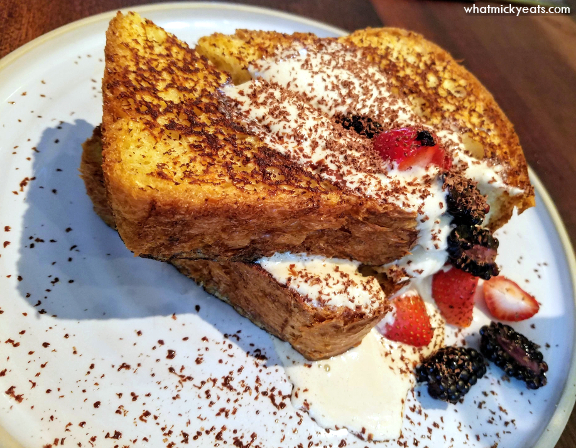 The toast was a bit dry and missing the advertised walnuts, but the cream and berries were a nice touch. 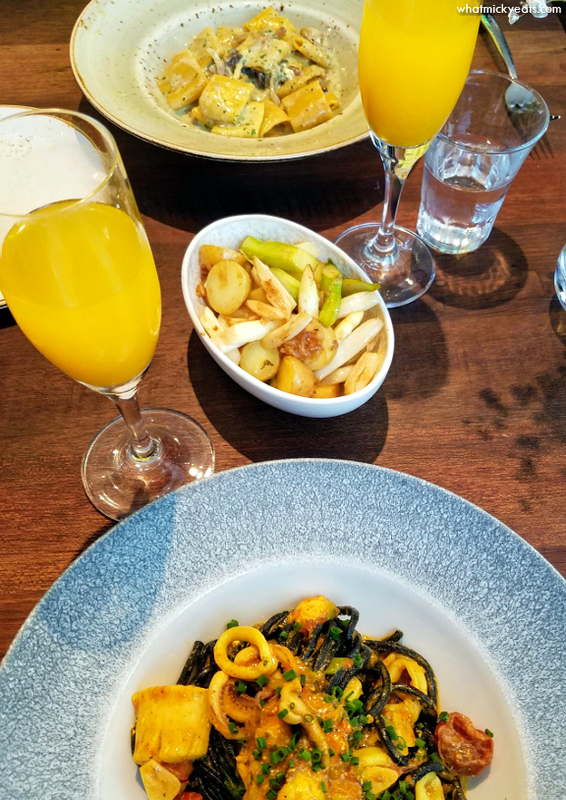 We enjoyed our personal bottle of prosecco served with fresh mango puree to make a tropical spin on the traditional mimosa, but the service was lacking and our glasses were often overlooked from being refilled. Also, our French Toast seemed to be forgotten about and we waited over 30 minutes for it. For the small room (roughly three tables were filled at a time), I was surprised by how quickly overwhelmed the staff felt. 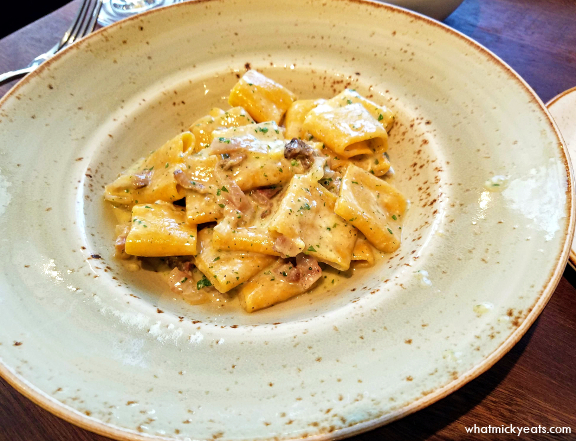 Though the pasta was great, the price and limited offerings does not really compete with the many better brunch deals in the city. 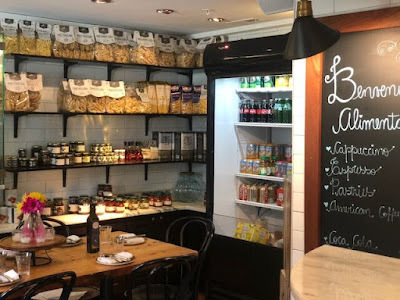 The lower level features an Alimentari, or boutique Italian market, where customers can purchase house-made items and fine imported Italian products. Fresh and dried house-made pastas are available for purchase by the kilo in the market, along with jams, olive oils, pastries, sauces and other imported Italian products. A “Lazy Box” is also available and includes a nightly selection house-made pasta and sauce for two to ten guests, priced starting at $25. The market is open Monday through Friday, from 8.30 a.m. to 6 p.m.